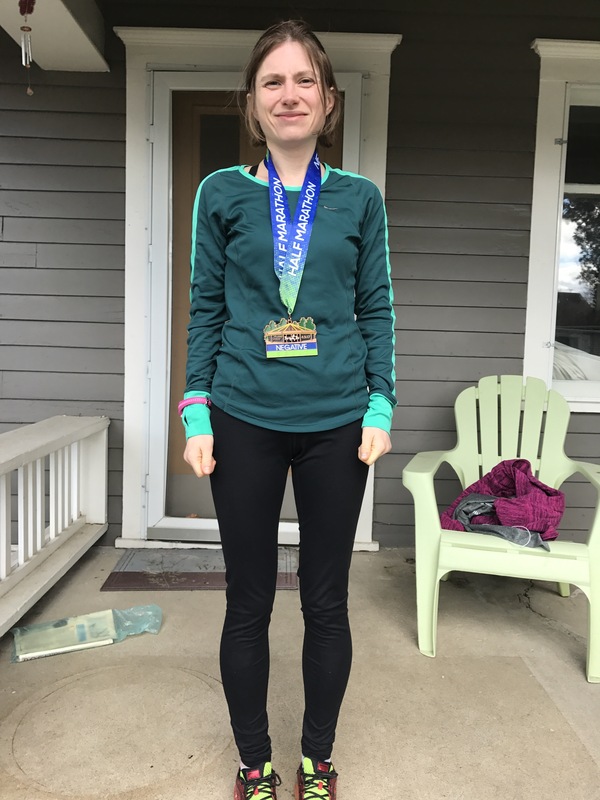 This was my 6th half marathon race. 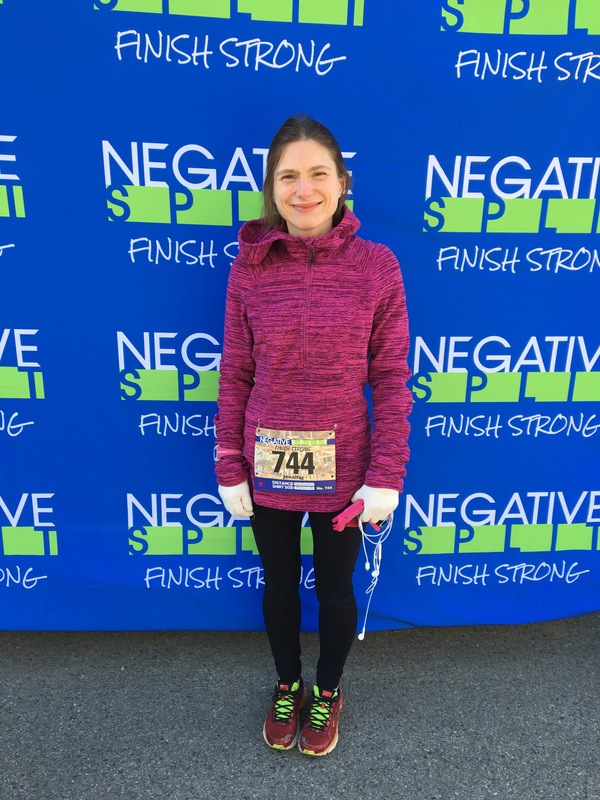 Every race I run I am always nervous. Usually my anxiety increases until I feel like I might puke. And this time my anxiety was high, but not that high. Honestly, I had low expectations for this race. I have been sick with a cold and allergies and been running slow this winter too. All in all, I would have been happy with any time under 2 hours. I had resolved not to beat myself up even if my time was over 2 hours. The morning was cold. In the 30’s and with a piercing wind. My original plan to wear spring weight clothes was scrapped and I broke out my winter gear. I didn’t sleep hardly at all the night before and had nightmares about getting to the start line late. Finally, I was sore from the 30 miles I had already put in over the course of the week. I hurt at the start line. But there I was. At the start. Lined up in the last wave of half marathon runners, hoping my broke down body didn’t make me into a liar. I had signed up in the last wave, expecting to finish in under 2 hours, and now hoping I could do it. 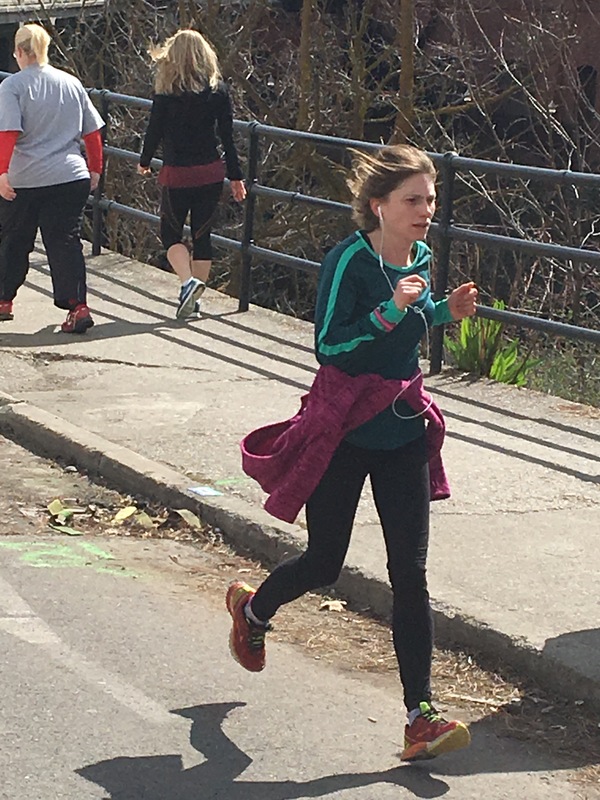 The first mile all I could think was that my body was moving too slowly as I watched people pull away from me. Then my running app announced my time: 7:58. I better slow down, I thought. Then for the next several miles I trundled along through Peaceful Valley, then Browne’s Addition. I barely registered the historic mansions passing by in my peripheral vision. I was fixated on the ground in front of my feet. When I got to People’s Park I caught up with the first groups of walkers I would pass. I was able to maintain a good pace and energy through switchbacks leading up to Kendall Yards. At the first turn around point I got to see some of the truly fast runners coming back my way as I went out and they flew back in. At about 8 1/2 miles I felt a flood of adrenaline and endorphins hit my brain and I couldn’t feel my body. It was like I had gone numb for a quarter mile. Then feeling returned and I continued on out to Mission Park. As I was heading out to start the loop around the park, I saw a friend of mine completing his loop on his way back to the finish. Then, after managing to get my fleece hoodie off, and all of my gear back on, I started the final 3 miles of the race. This is my favorite part. I love seeing people up ahead and passing them. Especially if we have been trading places during the race. I knew the route back in to the finish well since I run this area all the time during my regular runs. I was able to maintain and pick up speed those last few miles. Just after the 13 mile marker I realized I was still holding back and remembered that I didn’t need to anymore. This was it. The finish line. When I crossed it I had a PR of almost 2 minutes and placed 4th in my age group. I was tired but not spent. It was an excellent race. One of my very favorite things is roasted red pepper soup. Sometimes I buy the Pacific brand that comes in a box and eat it immediately. Sometimes I make it. Tonight I decided to make it. 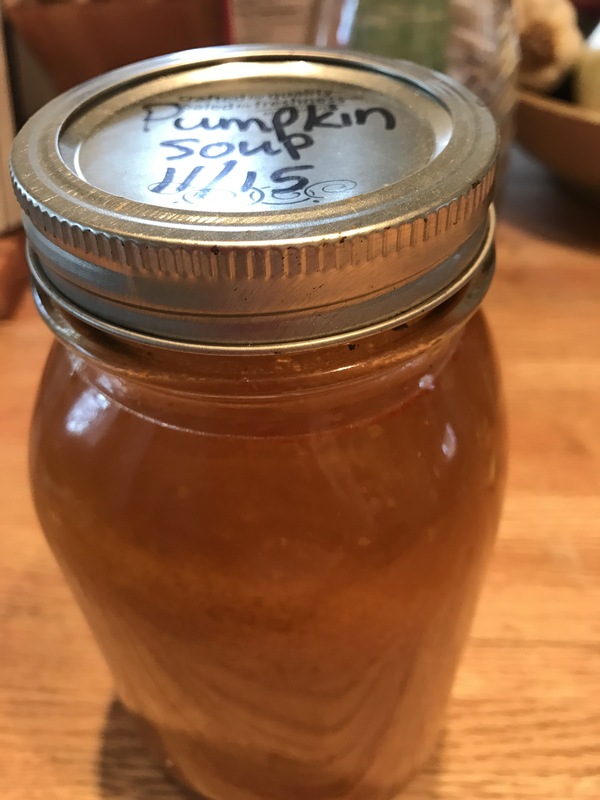 Note: I had a jar of my mom’s homemade, canned pumpkin soup on hand. If you don’t, then: cut any small winter squash in half (pumpkin, Hubbard, butternut, acorn, anything with orange flesh), oil a baking sheet and roast, cut side down, at 375 degrees F for 45 minutes. Let the squash cool enough to handle. Scoop the flesh from the skin and set aside. Add with the roasted vegetables, along with 2-3 cups of vegetable or chicken stock. 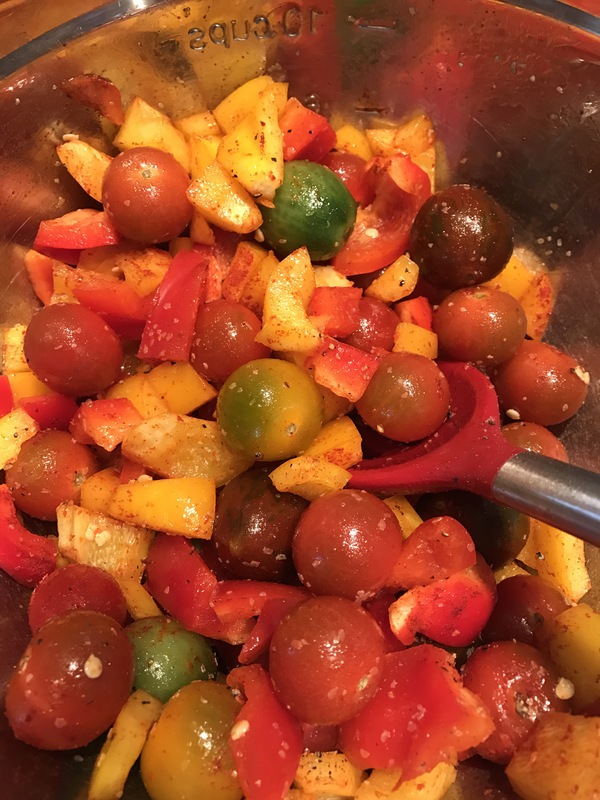 Preheat your oven to 415 degrees F. In a bowl, mix the tomatoes and bell peppers together with 1 1/2 tsp olive oil, salt, pepper and smoked paprika. Spread mixture out on a baking sheet and roast until peppers are browned at the edges and tomatoes have burst, about 25 minutes. While the vegetables roast, sauté the onions in the rest of the olive oil. Salt and pepper liberally. Allow the onions to cook until they are browned at the edges. Add garlic and stir to mix. Add wine and scrape up any browned bits then add tomato and bell pepper mixture. Stir some more. Add more salt and pepper if needed. Then add either pumpkin soup, or roasted squash and stock. Bring to a low boil over medium high heat, then lower heat and allow to simmer uncovered for about 30 minutes. Add parsley and stir. Finally, blend soup until you have the desired consistency, either in a blender (not my preferred method) or with an immersion blender. The result is a creamy soup with a smoky undertone. 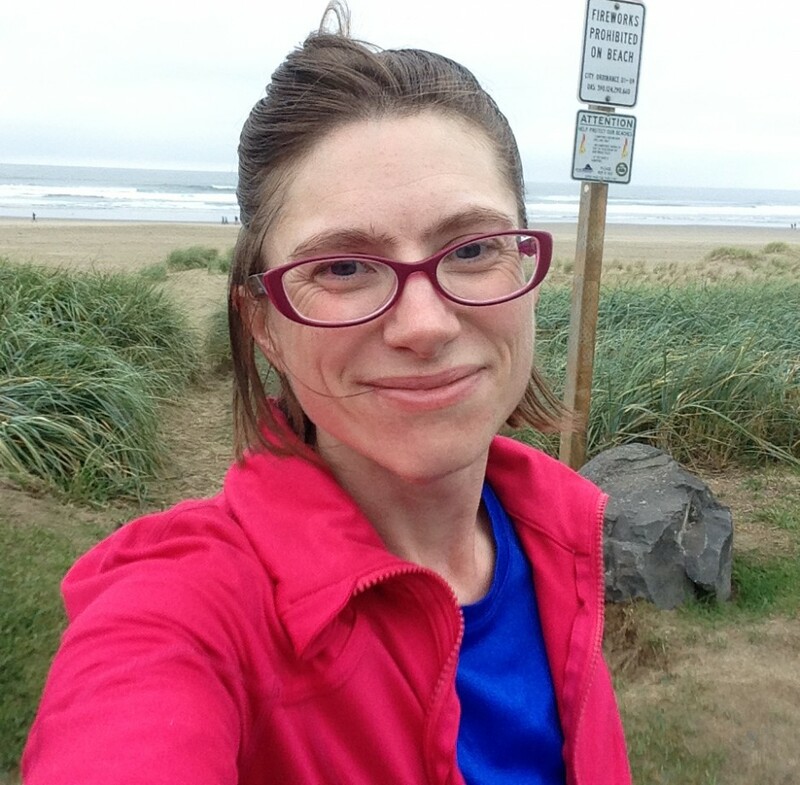 Today is my runniversary. Or it could be. I don’t actually know the date of my first run. Or the run that started it all. The run that was the first of hundreds of runs. Thousands of miles. I do know this: it was an unseasonably warm day in the first two weeks of April, 2013. It was a Thursday or Friday. And it was an act of desperation. It was a day when my anxiety was overwhelming. It was so bad I left work early in the afternoon because I couldn’t function. When I got back to my stifling second floor apartment I looked at my couch and thought that I could lay down on that couch and drive myself crazy listening to my racing thoughts and hyperventilating, or I could leave. I could run. I could run until I was tired. And then I could turn around and come home. Walk home if I had to. And so I did. I also don’t remember how far or how fast I ran. I’m sure it was slow and short. What I do remember is the feeling of my heart pounding, not because I was terrified about the collapse of every plan I had made for my life, but because my body was working hard. And I remember how warm it was. And I remember the sun shining on me. That was the beginning. The first step.